Write like you talk. Bad writing is often the result of trying too hard. Most of us think we know what good writing is supposed to sound like, but when we try too hard to imitate that ideal, our writing can end up awkward, unnatural, and stilted. 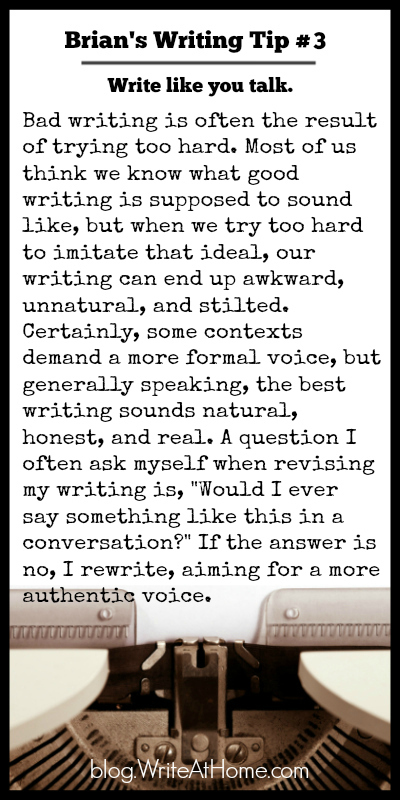 Certainly, some contexts demand a more formal voice, but generally speaking, the best writing sounds natural, honest, and real. A question I often ask myself when revising my writing is, “Would I ever say something like this in a conversation?” If the answer is no, I rewrite, aiming for a more authentic voice.